Does Fennel Contain Black Licorice? Florence fennel, Foeniculum vulgare v. azoricum, is an annual plant commonly used as a vegetable. Also called "bulb fennel," Florence fennel grows about 3 feet high and has a thick, bulb-like base that resembles celery. The leaf stems of Florence fennel are an important ingredient in Italian cuisine. 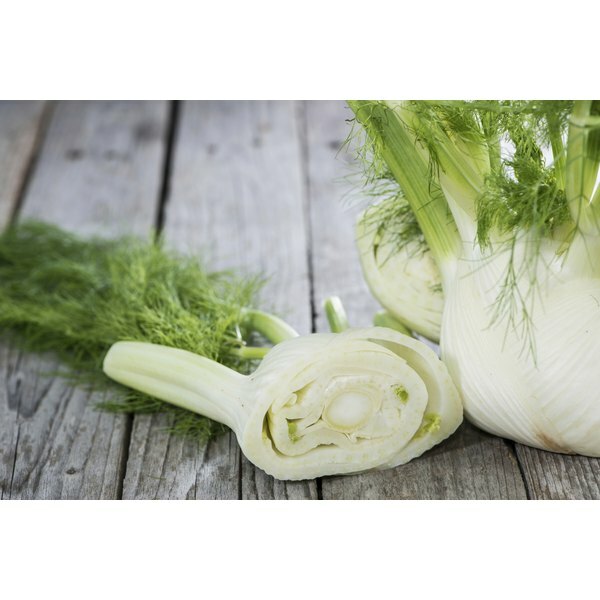 You can incorporate Florence fennel into a stir-fry, serve it boiled or steamed, or add slices of raw fennel to a salad. “Trieste” and “Zefa Fino” are two varieties of Florence fennel recommended by Washington State University Extension. Sweet or common fennel, Foeniculum vulgare, is a perennial plant grown as an herb as well as for its seeds. Sweet fennel can reach a height of 4 or 5 feet. In French and Italian cooking, fennel leaf is commonly added to sauces and mayonnaise. Fennel is also an ingredient in some kinds of breads, cakes and liquors. Bronze fennel or Foeniculum vulgare "Purpurascens" is a type of sweet fennel whose leaves have an attractive bronze cast. The plant is useful not only as an herb, but also as an ornamental in the flower garden. Bronze fennel is often planted in butterfly gardens, since it attracts butterflies and other beneficial insects. In particular, bronze fennel is an important host plant for the black swallowtail butterfly. The term "fennel" also refers to fennel seed, which is actually the fruit of the plant rather than a true seed. The long, thin curved seeds vary in color from brown to light green, with the green seeds being considered the most valuable. Fennel seeds are used to add sweet anise-like flavor to the foods of many regional cuisines The seeds are also used as an ingredient in a wide range of products, including teas, soft drinks, curries, sausages, cough drops, laxatives and room sprays.